View Baikal Winter Expedition on a larger map. "How can you be active all day outside at these very low temperatures without freezing?" some of our friends were asking. "What about sweating during cycling without being cold afterwards?" Well, indeed it is a challenge to combine sportive activities at very low temperatures with adventure in nature and wilderness. 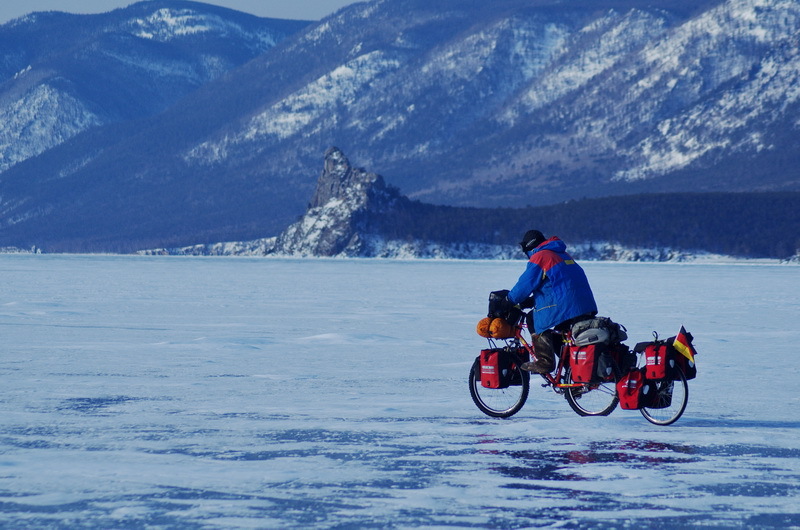 Being exposed to the winter weather all day without a warm room in the evening, being completely self-contained without external support, that is the challenge we took up when we planned our Winter Mountainbike Expedition on Lake Baikal. 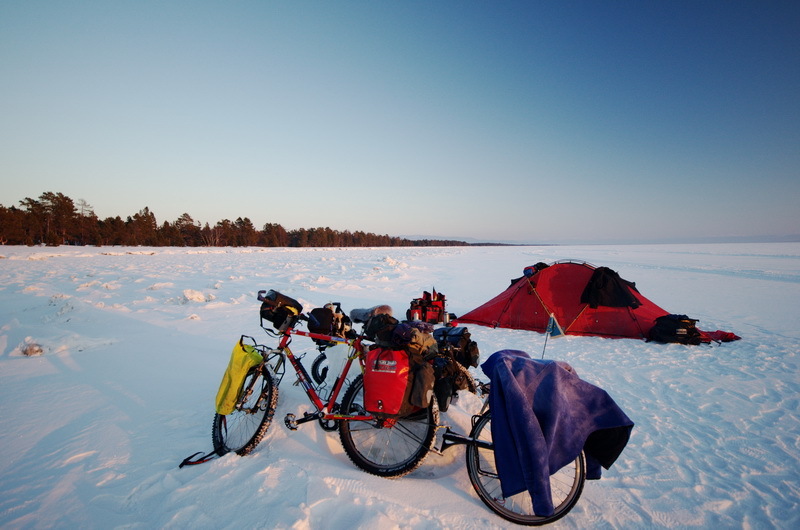 Our plan was to start at the northern end and then cycle all the way down to the southern tip of the worlds deepest and oldest sweet water lake. 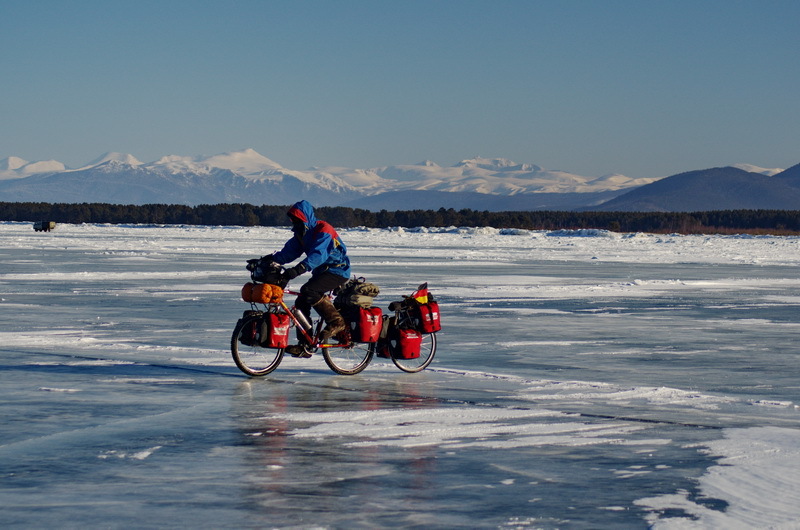 It will be ice and snow, the beauty of the lake and the two of us on our bikes, nothing more. First trials of cycling on the lake. Sunset on the ice just outide of Severobaikalsk. 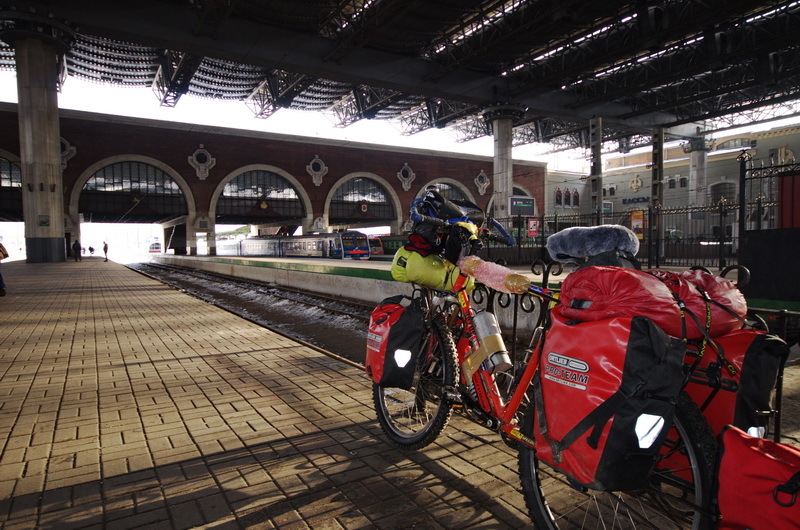 Lake Baikal is quite far away from our home in Germany, so we already needed five days on the Transsiberian-Baikal-Amur train to reach the starting point of our cycling tour in Severobaikalsk. 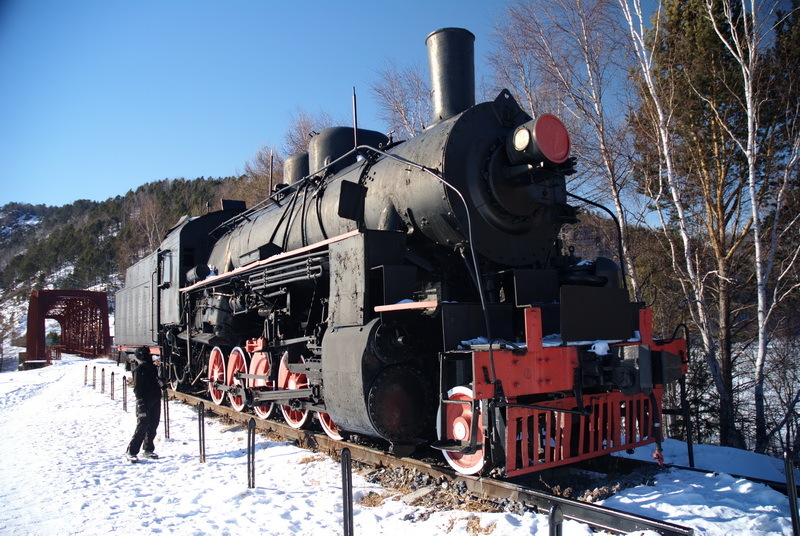 As we left the nicely heated train wagon to the minus 25 degrees cold January day, it indeed was a bit of a shock for us, and it needed two days to adapt a bit. 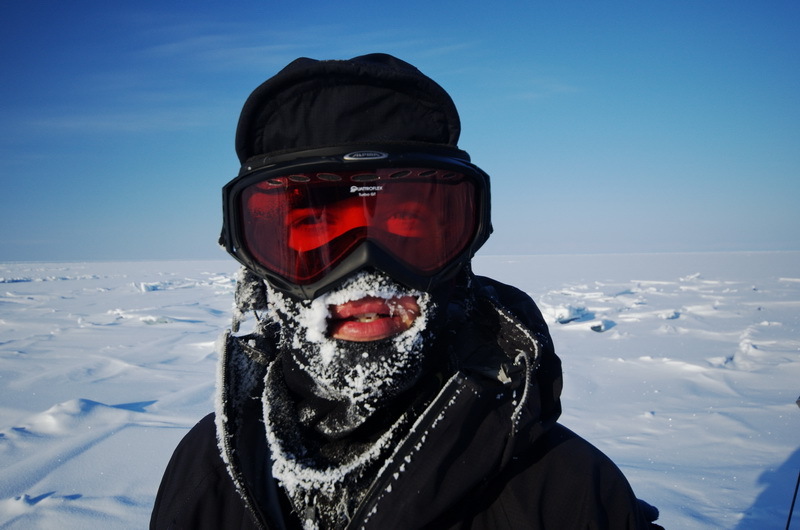 From then on, our daily rhythm was defined by outside temperature, the day length and the total time period of five weeks we had available to finish our tour to the South tip of the lake. 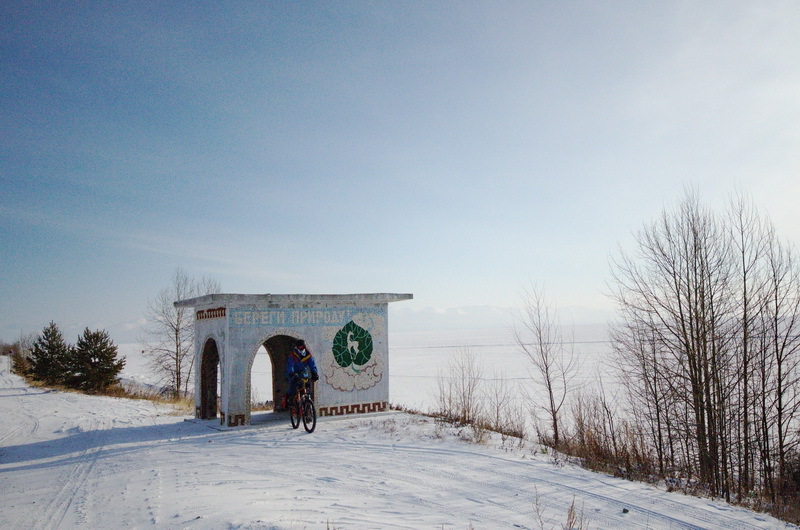 So, on 31st of January, in wonderful, cold winter weather we cycled to Nishneangarsk to start our trip at the northern point of the lake. 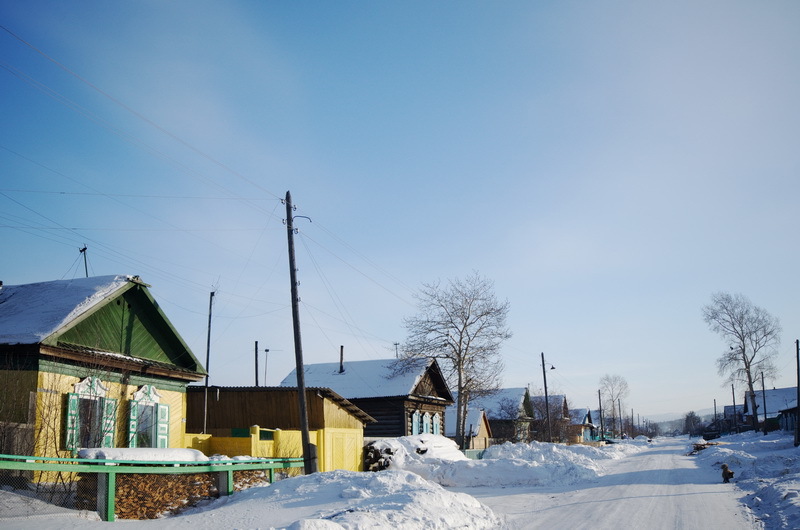 However, already on the next day we experienced the diversity of Siberian Winter with dark snow clouds and snow flurry. 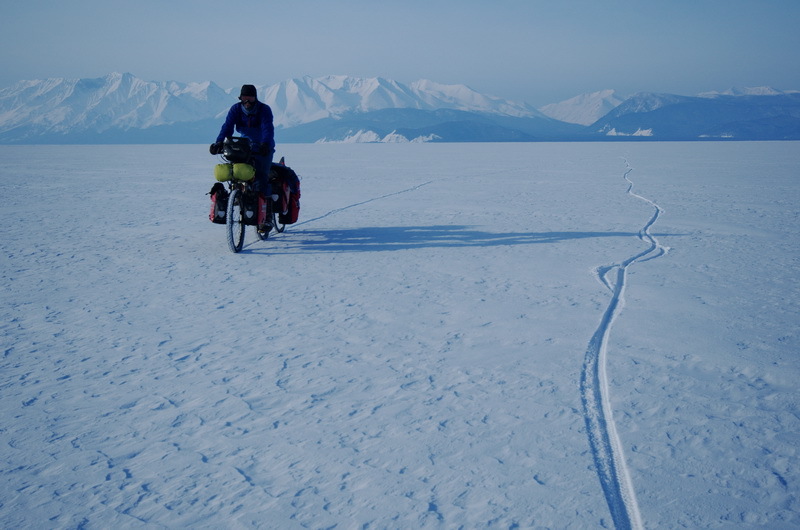 It was hard to see the car tracks heading south to Baikalskoje in this conditions, and in general cycling on snow was very wearing. It became clear that weather, wind, snow and ice conditions were the dominating factors and we would have to adapt our schedule to these conditions. 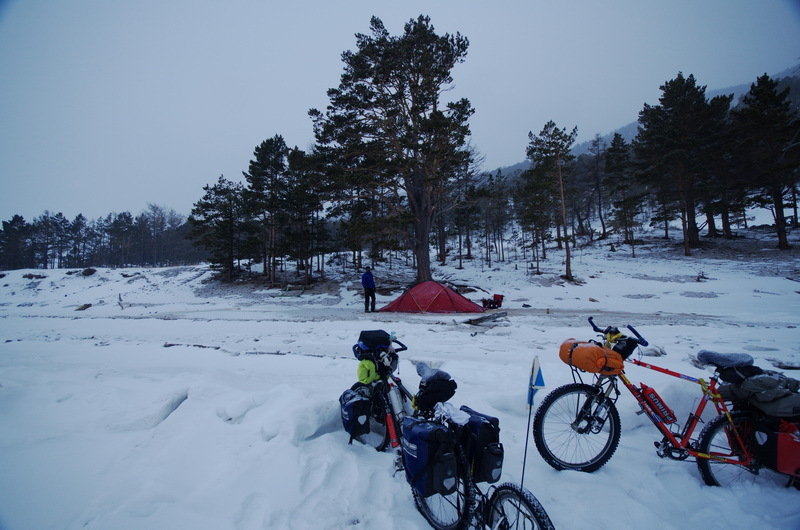 Another challenge we faced each day was the task of finding a suitable spot for pitching our tent at night. 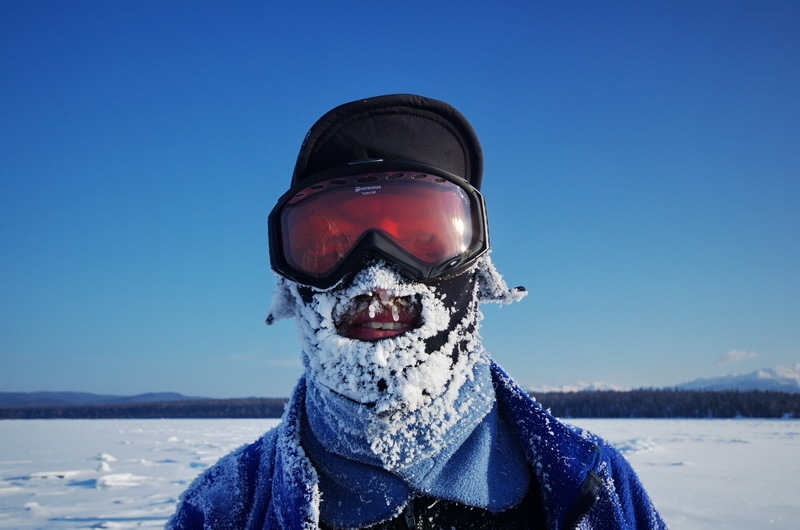 Our first night on the lake was rather unpleasant as we were constantly wakened by the cracking and snapping sounds of the ice beneath us. Sometimes it reminded us of thunders and earthquakes which moved through the ice below us. 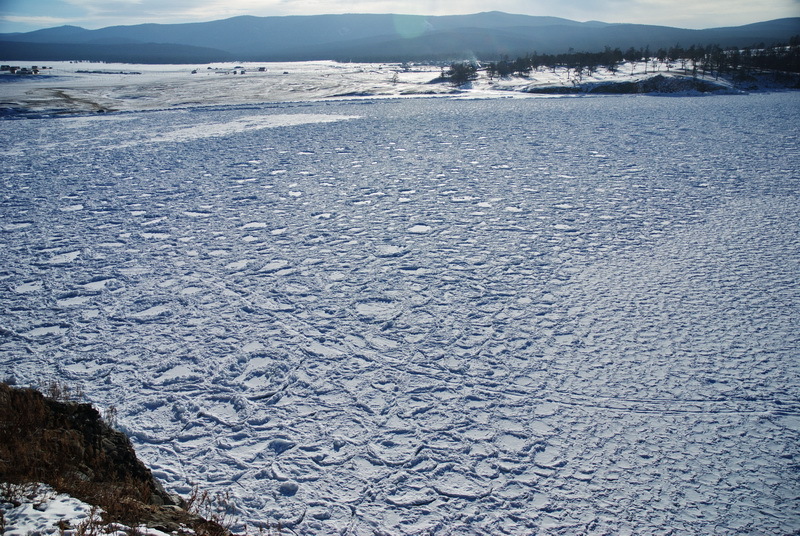 Although the lake is frozen with a thick layer of ice, some sections of the ice are in constant movement. Especially during low night temperatures, cracks appear and move and one never knows how far away from the tent new cracks will open. 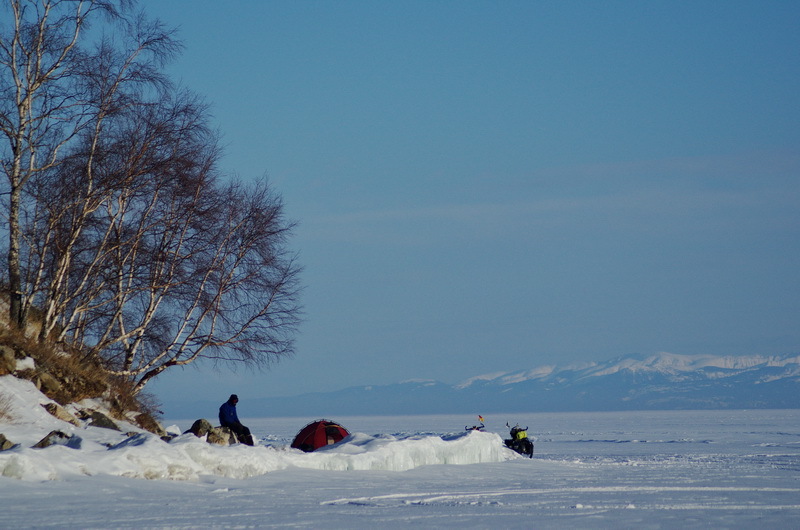 So we quickly learned where to find "quiet" zones on the ice or we simply pitched our tent on the shore of the lake. 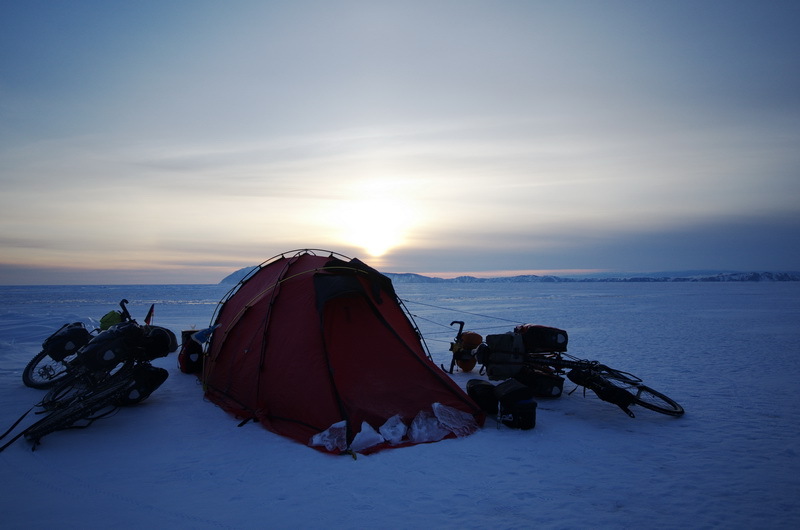 A good night's rest was vital for us, as we were active basically from sunrise to sunset every day. The snow cover is a big challenge to the cyclist. Finding a route through packed ice is not always easy. A "road" of freshly frozen water that emerged from a gap. A small gap to cross. Black ice, clear ice, all drinkable. 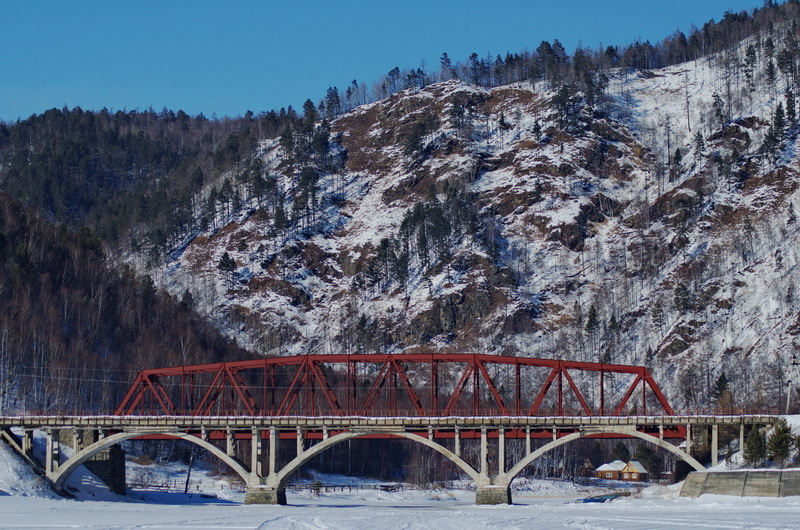 The route we followed took us from Nishneangarsk to Baikalskoje and further south to Kotelnikovskij. From there we crossed the lake to the East coast to then follow the car track south via Davsha and Kurbulik to Ust Bargusin. 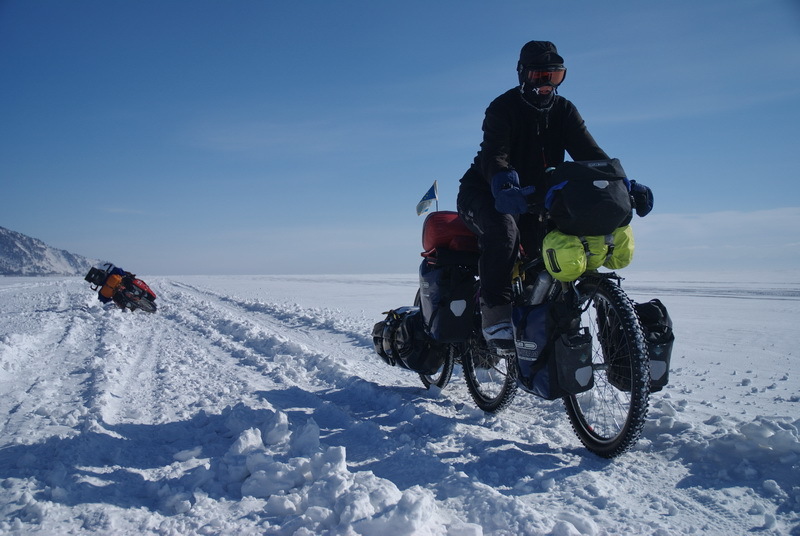 This section of our tour was the hardest in terms of snow cover, on some days we had to push our bikes for many hours and kilometers through deep snow. Our daily mileage varied from 25 kilometers to 55 kilometers depending on ice and snow conditions. 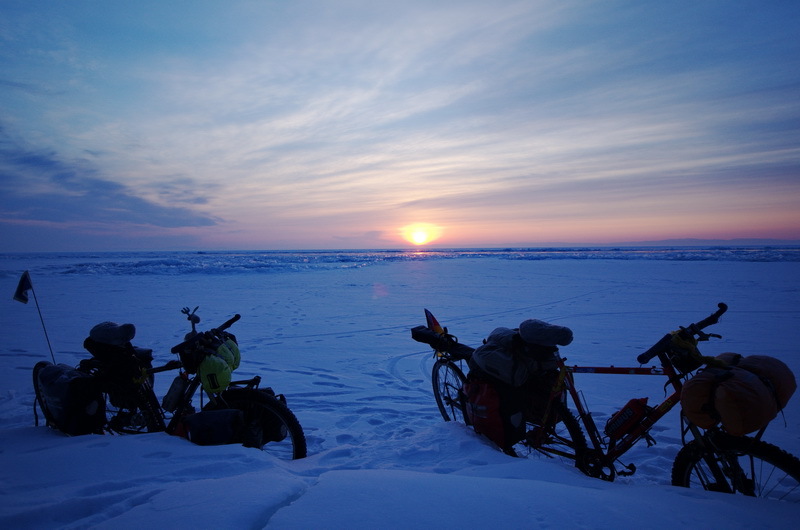 Best cycling conditions we found south of Ust Bargusin and near Olchon Island, where there was almost no snow cover on the lake and we were able to cycle on blank ice in any direction. 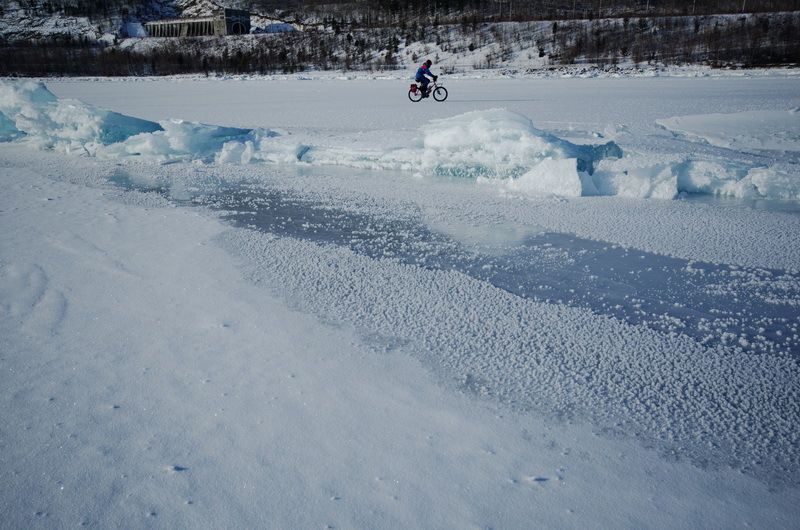 For that, our bikes were equipped with studded tires, which gave us good grip even on blank ice surfaces. 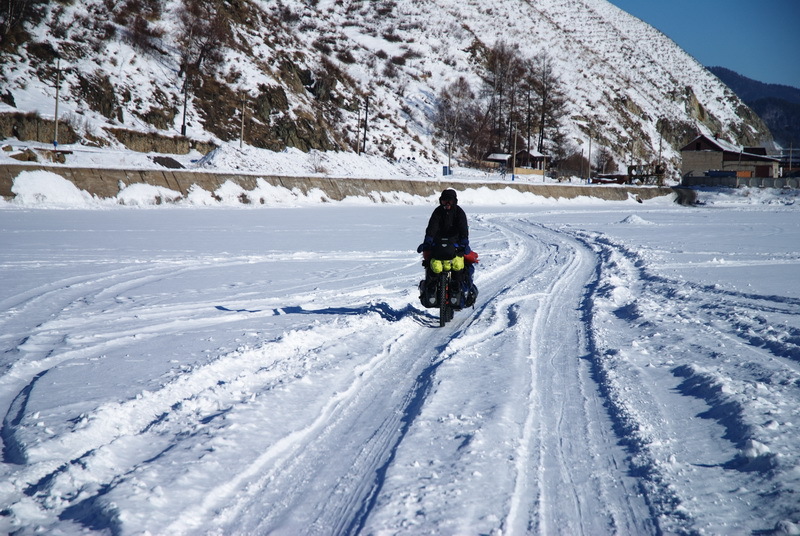 These days with riding on the blank ice were pure joy and gave us a great feeling of freedom. Ice-covered rocks on a small island. 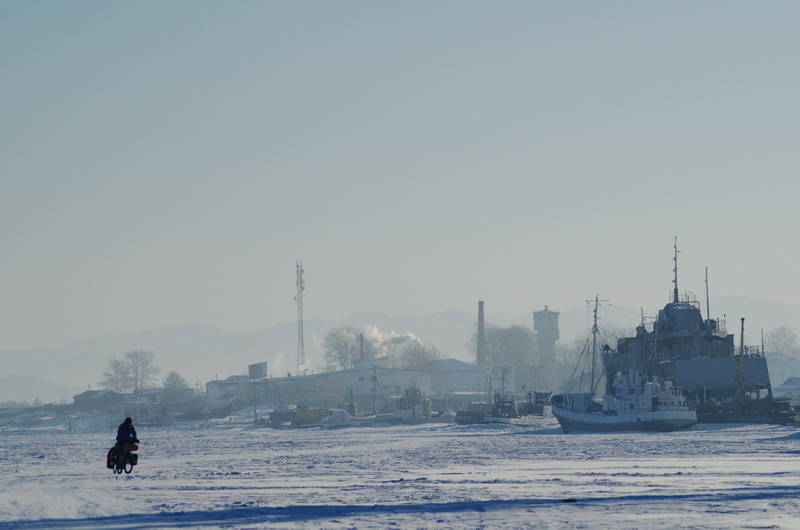 Boat in the harbour of Ust-Bargusin. 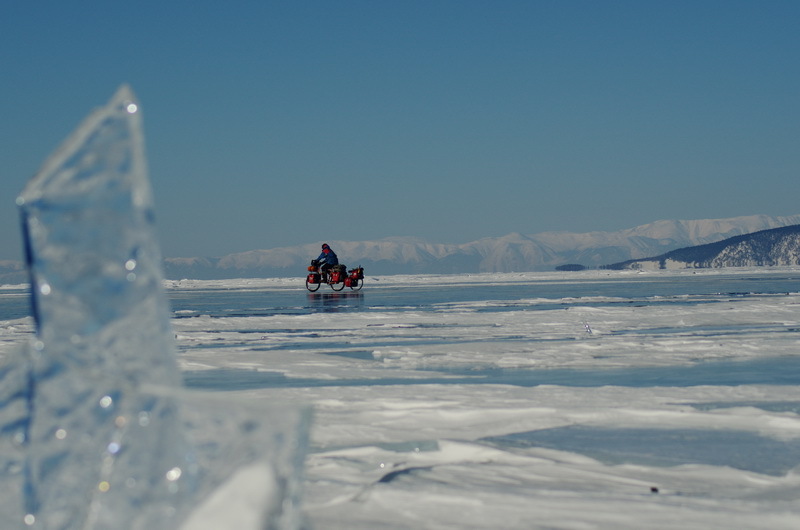 After stocking up with food and fuel in Ust Bargusin we again crossed the lake towards Olchon Island. 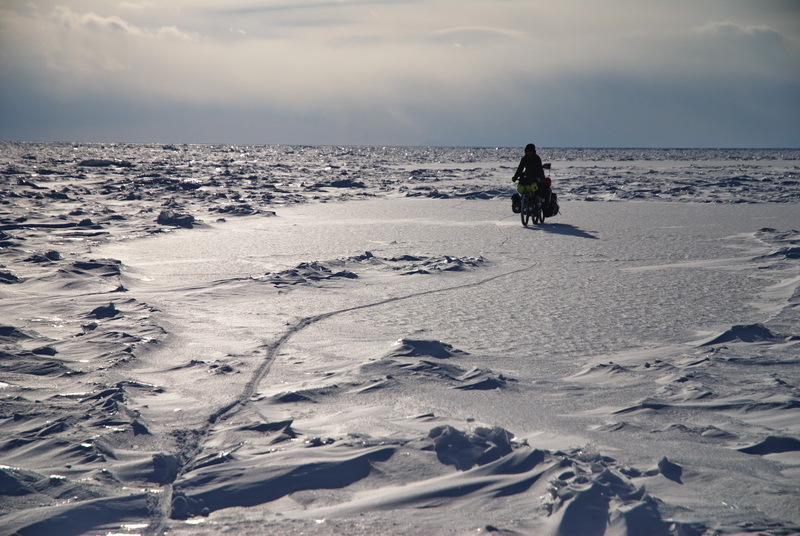 For this distance of about 150 kilometers we needed a bit more than two days on very good ice conditions. Only three major cracks stopped our riding speed, but it was easy to push the bikes over. Cracks appear and move and one never knows how far away from the tent new cracks will open during the night. 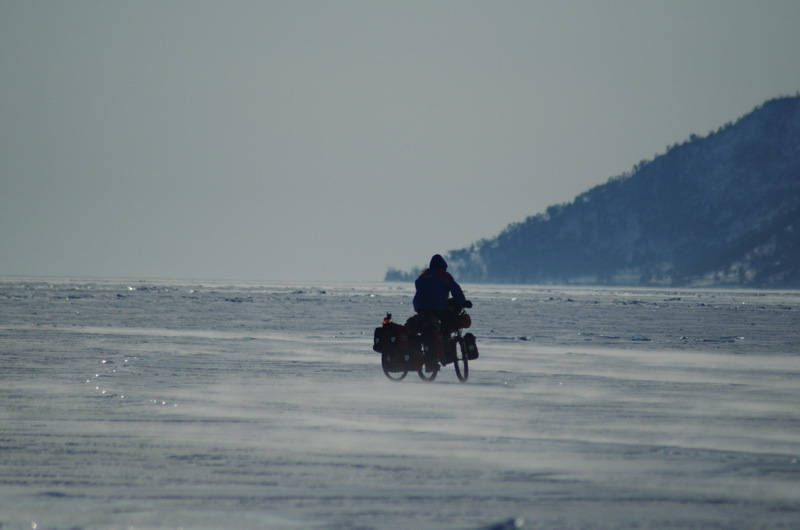 As we approached Olchon Island, two fishermen approached us with their car, asking where we were cycling from. They almost did not believe we were cycling over from Ust Bargusin. We were again judged with similarly astonishing looks as we entered the guest house in Chushir, where we again stocked up on food and fuel. Packed ice at the coast. Sunset after a stormy day. In general, our diet was very good and diverse. We started the day with a big portion of cereals cooked up with milk powder and dried fruit. 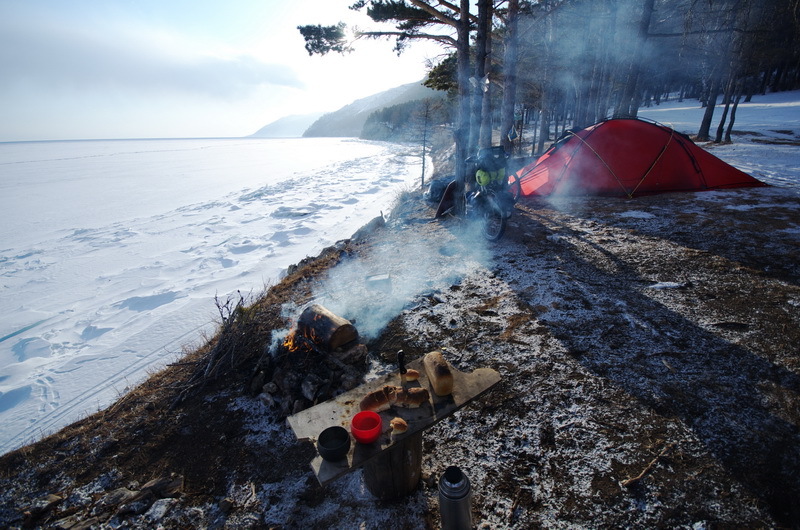 In the morning we melted ice to fill our two large thermos bottles which would supply us with hot water and tea during the day. After every two hours cycling we had a small break in which we had some energy drinks, energy bars, a selection of nuts or some ham. Of course we had to thaw our food in our pockets in advance, as everything was frozen hard at temperatures way below that of a home freezer. The main task during the evening then was to again melt enough ice to cook a dinner meal of rice, pasta, mashed potatoes, buckwheat or couscous enriched with dehydrated vegetables and meat. A bar of chocolate serve as dessert, and tea or hot chocolate was for drinking. 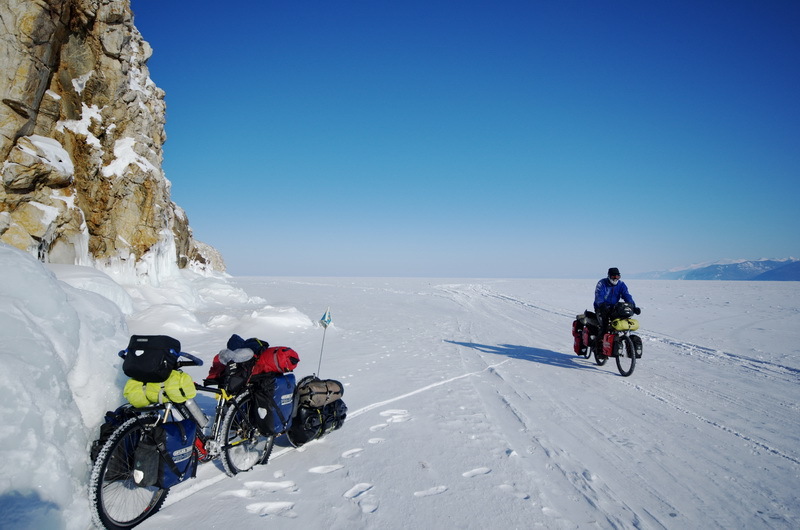 From Chushir we again cycled to the North Cape of Olchon Island and then followed the lonely East coast. This part of the trip was particularly impressive. 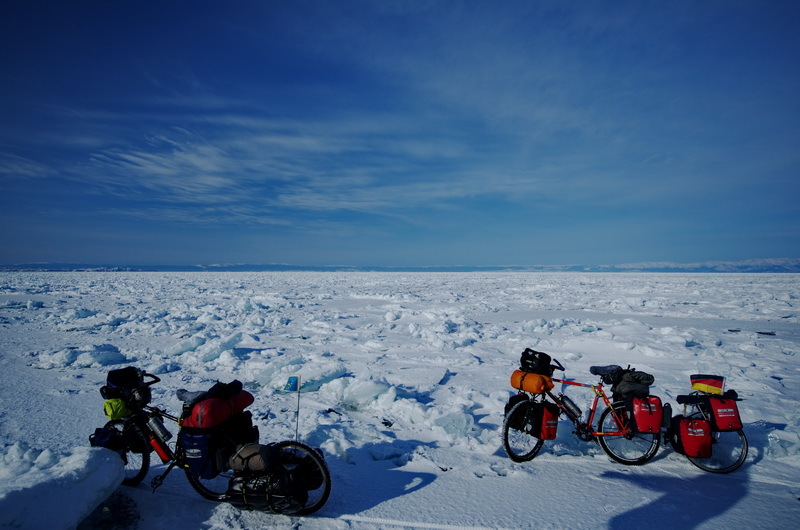 We enjoyed the remote shore landscape and the almost blank ice conditions for cycling. On this section we did not meet any other humans, but saw many tracks of wolves. 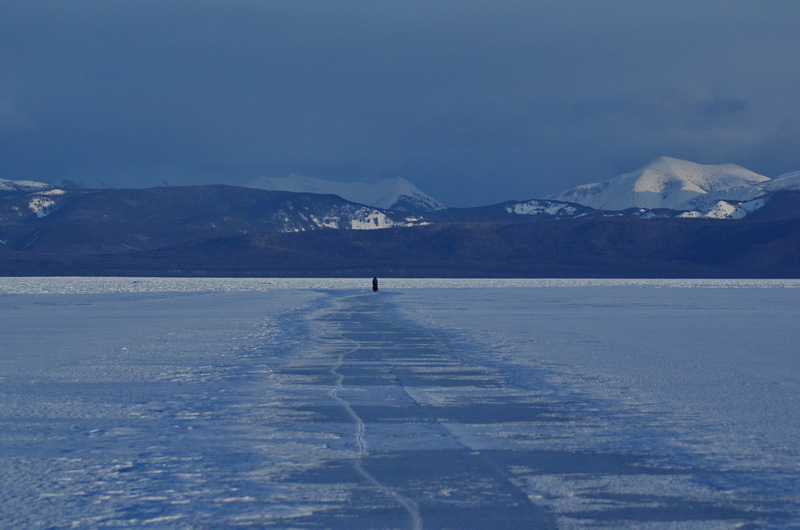 We then continued on along the West coast of Lake Baikal towards Listvianka. Again this section was very diverse and attractive with its steep cliffs and ice-covered rocks. From Bolshoje Goloustnoje on we sometimes met other people on the lake, such locals with their cars, and some other tourists who were hiking on the ice. In these cases, we were then seen as an attraction for them. Nice camp spot on a sandy beach. Camp in the forest with fire. 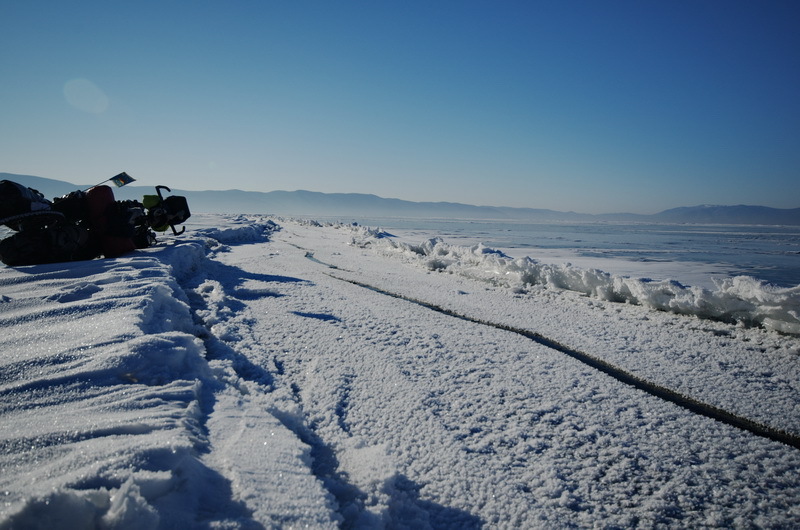 Againg fighting snow: Baikal south coast. 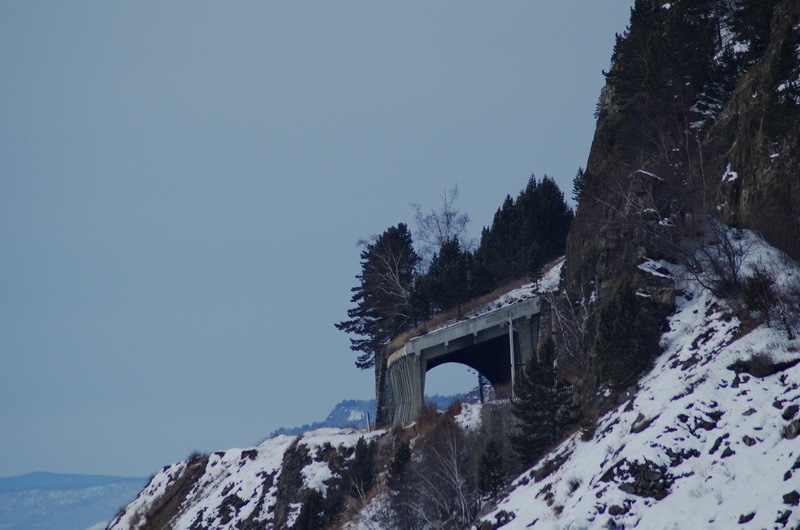 Tunnel of Circum Baikal Railway. 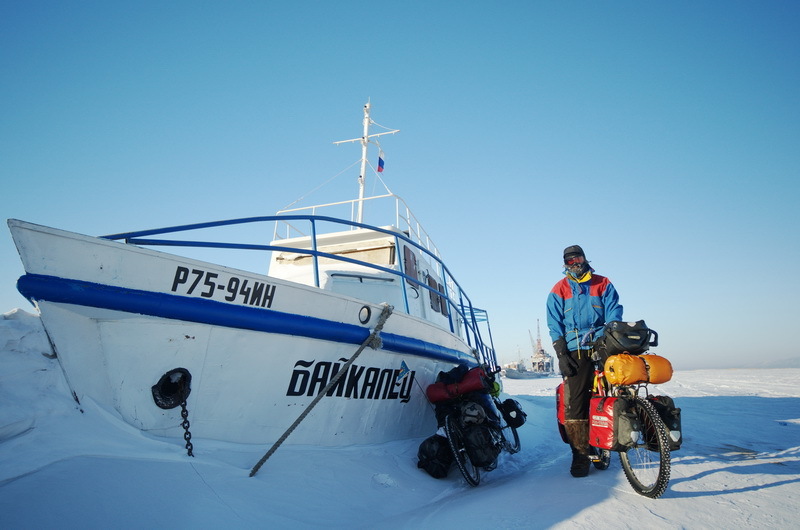 From Port Baikal on towards Kultuk we suddenly again were fighting with deep snow conditions and strong headwinds. It seemed, the lake would not allow us to finish. 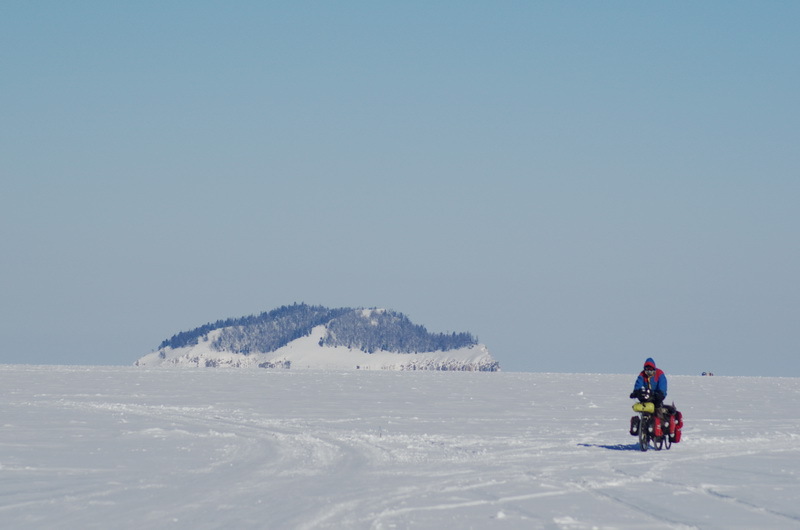 However, then at midday on March 2nd we reached Kultuk after 27 days of cycling and covering a distance of 1075 kilometers on the ice of Lake Baikal. 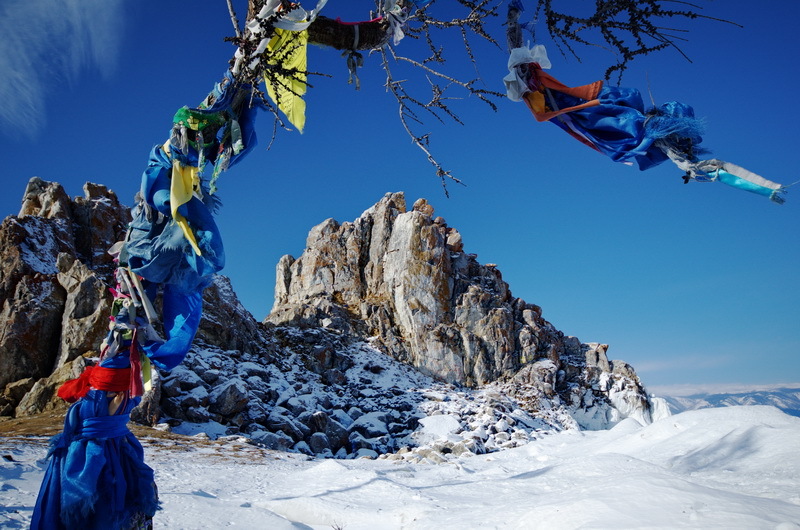 Temperatures in the beginning were around minus 40 degrees at night and minus 20 during the day. 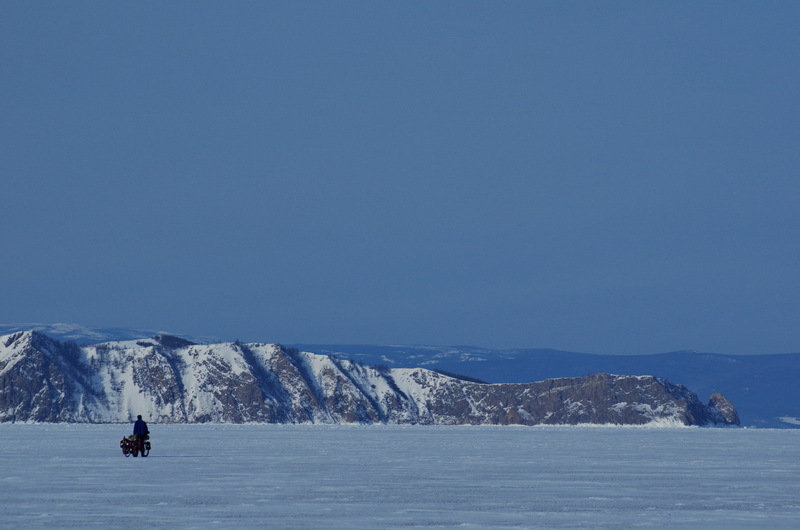 As we headed towards the south end of Lake Baikal, temperatures increased to minus 5 degrees during day. It seemed that spring time was coming with the beginning of March. Soon we were sweating in our warm winter clothing, the winter boots seemed too warm and we took off a layer of gloves. 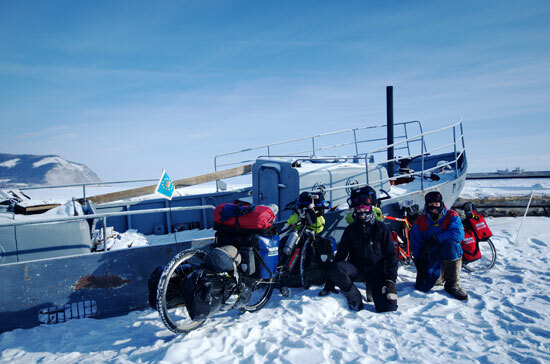 As we reached Kultuk our biggest challenge then was cycling to Irkutsk on the road M55, which is a major inter-city road in East Siberia. Big thanks goes to all the truck drivers who were very considerate with us when overtaking on the steep inclines and in the narrow curves. 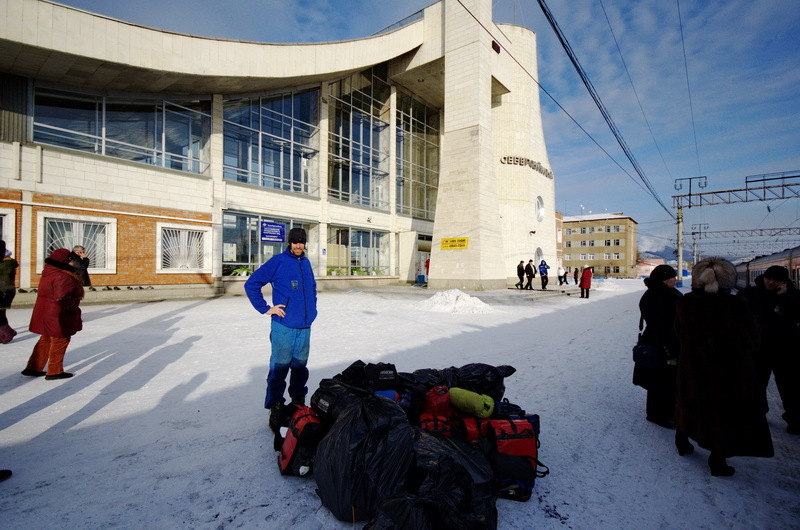 After two days on a road with very hilly terrain, we finally reached the city of Irkutsk where we now spend a few days for resting before we will again take the train to Moscow and back home to Germany. 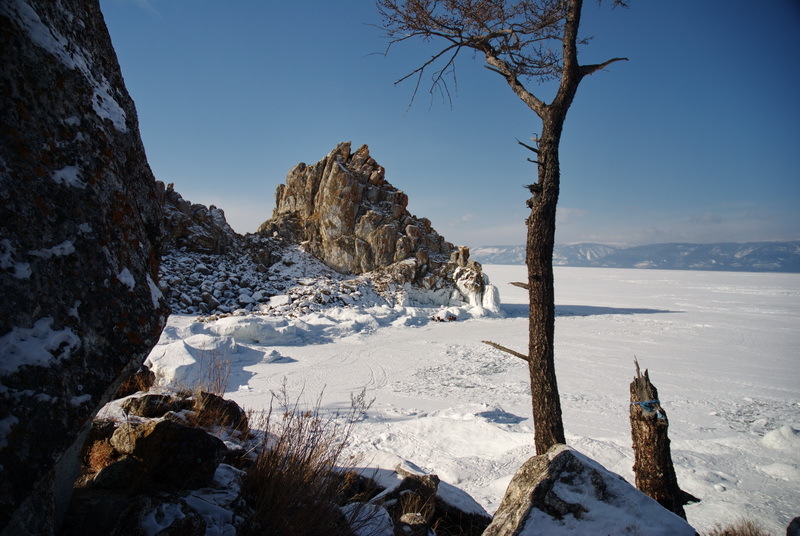 Although being physically strenuous, we enjoyed the beauty of Lake Baikal and the harsh conditions of Siberian winter. We met friendly and helpful locals who made our tour a special and pleasant memory. 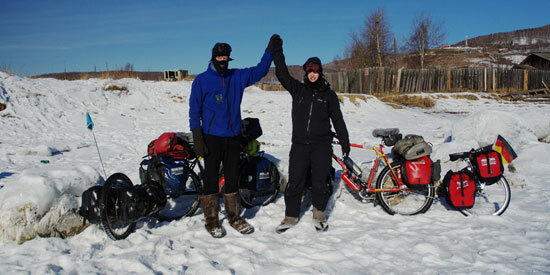 For sure we will come back to Russia and Siberia again some day, and of course in Winter! Copyright © 2011 Waltraud Schulze & Andy Heßberg.